The demands placed on parents caring for a child with autism can contribute to a high level of parental distress and adversely affect family functioning. Unfortunately, families are often exposed to unsubstantiated, pseudoscientific theories, and related clinical practices that are ineffective and compete with validated treatments. The time, effort, and financial resources spent on ineffective treatments can create an additional burden on families. As a result, parents and caregivers everywhere are eager for credible, research-based information on the most effective treatments for autism. Chaos to Calm: Discovering Solutions to the Everyday Problems of Living with Autism by Martha Gabler describes an evidence-based method that can be used by parents and caregivers to address the everyday challenges associated with autism and improve the quality of life for their children and families. Chaos to calm consists of 15 chapters. The first chapter introduces the reader to TAGteach and describes how the method works. At the outset, Gabler takes a reasoned and reasonable approach by commenting that TAGteach is not a substitute or replacement for other behavioral methods, but one that can serve as a powerful adjunct to these and other teaching strategies. She also notes that TAGteach is not a cure for autism, but a method that was uniquely successful at teaching her son functional behaviors that allowed her family to experience a better quality of home life. The subsequent chapters are arranged to describe what Gabler feels are a logical progression of skills to learn. She begins by describing step-by-step how the TAGteach process can be applied to a single, less challenging task (“Quiet Mouth” behavior) and then to more complex and difficult problems such as tantrums and transitions; self stimulatory behaviors; aggression, self-injurious, and destructive behavior; and arguably one of the most challenging and stressful behaviors of children with autism, chronic sleep problems. There are also chapters focusing on “going into the community” and social, life, and play skills. The final chapters provide a summary of the TAGteach approach, answers to some common questions regarding application of the method, and future directions for the use of TAGteach. Chaos to calm is more than a “how to” book or guide to behavior management. Gabler puts a human face on applied behavioral methods and describes her challenges and experiences with thoughtfulness, compassion, and humor. She also emphasizes the importance of responsibility; following rules and understanding limits; and “learning the rules of society.” As Gabler notes, it’s important to teach the concept of a rule for the child. She also reminds adults to follow a very important rule: only ask your children to do what they are capable of doing. 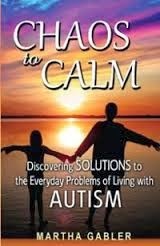 Chaos to Calm: Discovering Solutions to the Everyday Problems of Living with Autism is highly recommended to parents and caregivers of children across the autism spectrum who will find the book a source of inspiration and encouragement as they begin their own personal journey from chaos to calm. Professionals will also find the book a valuable resource for use with families and teachers who have a pressing need for practical, evidence-based interventions to deal with the daily struggles and challenging behaviors of children with autism. Gabler, M. (2013). Chaos to calm: Discovering solutions to the everyday problems of living with autism. Waltham, MA: TAGteach International. Lee A. Wilkinson, PhD, CCBT, NCSP is author of the award-winning book, A Best Practice Guide to Assessment and Intervention for Autism and Asperger Syndrome in Schools, published by Jessica Kingsley Publishers. Dr. Wilkinson is also editor of a best-selling text in the APA School Psychology Book Series, Autism Spectrum Disorder in Children and Adolescents: Evidence-Based Assessment and Intervention in Schools, and author of Overcoming Anxiety and Depression on the Autism Spectrum: A Self-Help Guide Using CBT. His latest book is A Best Practice Guide to Assessment and Intervention for Autism Spectrum Disorder in Schools (2nd Edition).